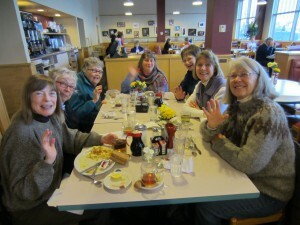 The church women’s group has a regular meeting the second Wednesday of each month, 8:30-10:00am, at the Egg and I Restaurant on University Ave. The time and place are the only “regular” things about meetings. Topics of conversations range from personal to pragmatic, from care for the earth to care for each other, from news to new ideas. Women of all ages are invited to attend. (This is a meeting with no preparation and no clean up!) You will find a meeting of the minds and hearts with old friends and new over a delicious breakfast of your choice. If you have questions, please contact the church office at 612-378-2380 or ProspectParkUMC@gmail.com, and we will assist you. The men’s group meets on the second Saturday of most months at 8:30 AM*. It is a group of men affiliated with PPUMC, but anyone is welcome to attend. Most of the time someone will volunteer to host the meeting in their home, but sometimes they meet in the church basement. They often get together, have something to eat, and chat about what is going on in everyone’s lives at the time. Other times a topic is chosen of current interest and discussed, being lead by the person or persons that brought up the topic. There are no requirements as to who may attend or what is discussed. The host typically furnishes a breakfast dish and the attendees bring something to supplement the meal. Questions can be sent to Gordon Myers at gmyers333@gmail.com. *Sometimes a break is taken during the summer, as many are out of town on vacation.